The first & best transfer simulation software available. Works with any tri-axis transfer press and automation tooling. Testimonials from the people we've helped. Read what others have to say about our product and the many ways we've helped in a variety of industries. Discover more about how T-Sim started and the problem we set out to solve. Learn how we can help improve your transfer die process. 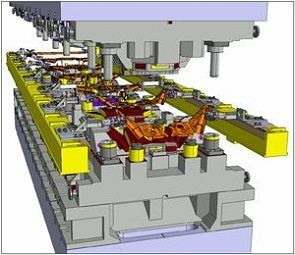 Get more information about our Transfer Die Simulation and find out why it can help you. Looking for more help? Contact us today! Increase production rates, Get rid of headaches! Die Shops, Designers, & Stampers... Get the software that will change your world for the better. T-Sim 4.0 software runs a transfer press simulation that checks your files before any die work begins. It optimizes transfer curves, eliminates crashes and clashes, optimizes SPM, and generates valuable reports. For any press... mechanical or servo. You can even optimize your files for existing tooling.